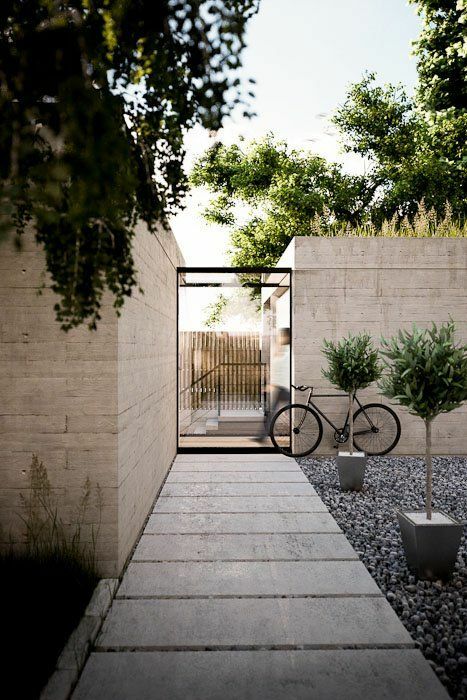 Paths can often be accentuated by adding a flower pot, trough or planter. They can help the designer lead the observers eyes down the path to where the central piece is or they can add life and feeling to a go between area. It is easy to view a path a simply a means to an end but adding pots makes a feature of them. 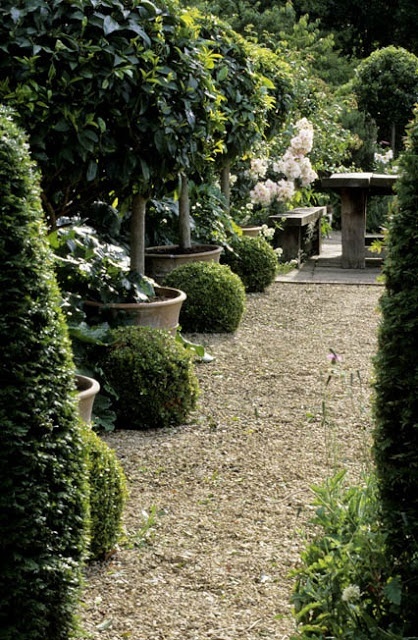 Pots are particularly relevant for this area of the garden because they don’t need planting and there can often be little or no where to plant in paved or path areas. The images below show a variety of pots on paths, from small flower pots sitting on stairs to large feature pots next to meandering paths. Hopefully you like them and are inspired. 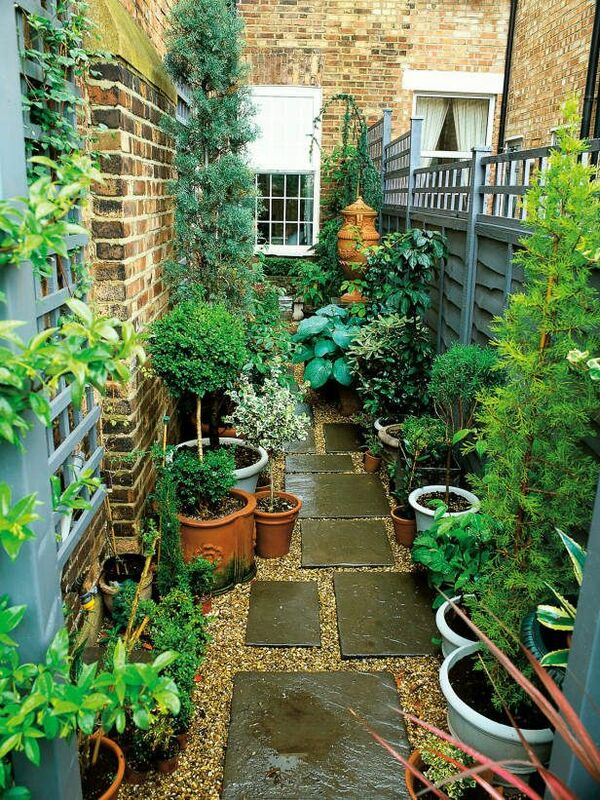 Having a courtyard with pots in can work well for the same reasons a planters on a path. 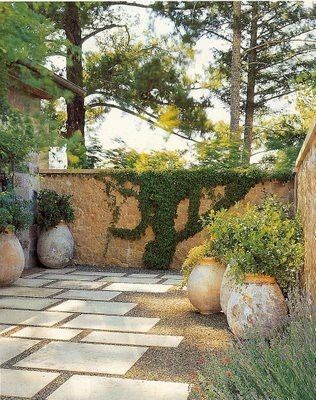 The gathering of pots is a certain style of using the vessels and it can prove very effective, particularly when you use it in the context of an Italian style garden with terracotta pots. 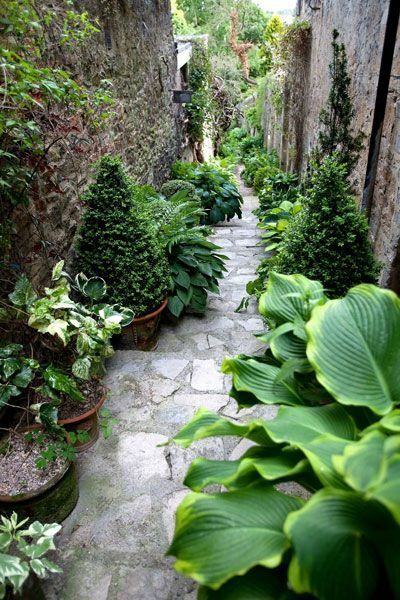 Often the side passages of houses are neglected and can be hard paved or gravel. Rarely are they rich feeding grounds for foliage why is where the idea of lining the path with pots works so well. You loose a little space but you gain a much more appealing walk way that is teaming with life. 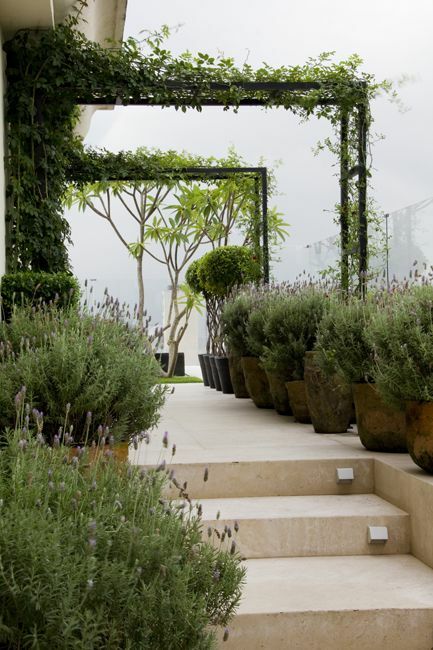 Various different pots suit a paved space but in general they are tall thin planters due to space restrictions. 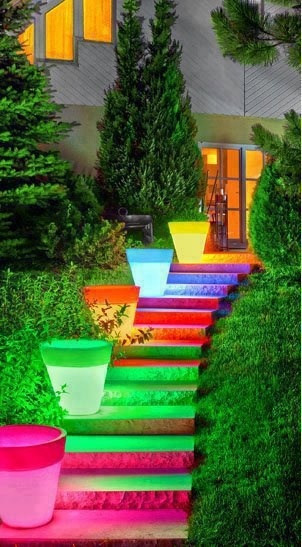 To create a feature that entices people why not add in some light? This would work very well for an event where you want to pick out the path at night so people know where to follow. The opposite to clusters of mixed pots is of course a more unified approach and the more contemporary gardens choose this. They are less striking in colour but look very neat and stylish. 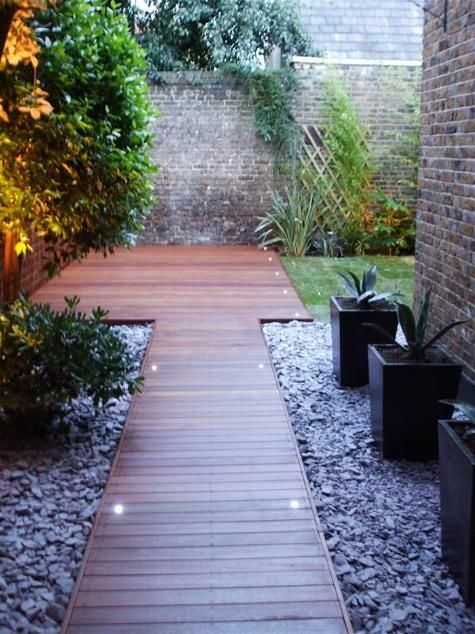 A mix of materials can really make the path a striking feature. 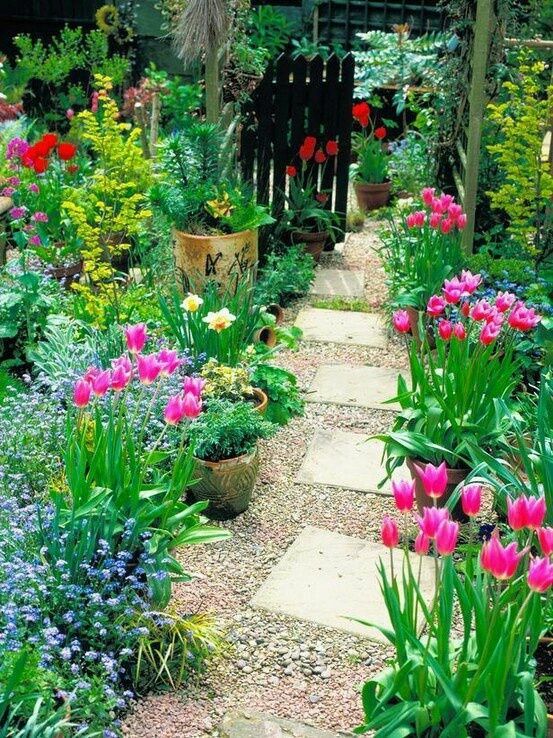 By adding pots and foliage close to the edge of a path you can give the feel of walking through a field of flowers without the danger of damaging them as you tread. Some plants have a very strong scent that is unleashed when the plant or flower is brushed. This is another reason why using planters or flower pots on a path is a nice touch. As the users walks past the plants they can touch them and release the scents. Just because the planters contain earth doesn’t mean that this is the only place you can plant. If your path is able to host foliage then it can be nice just to use the planters as a means of differentiation from the other plants. And finally you don’t need many plants and they don’t need to be big or high maintenance to create a great effect with flower pots on paths.